"Visitors to Dav's Hope should conduct themselves in a manner befitting this hallowed place. Although the site was not consecrated as a cemetery, it now functions as one. Persons not complying with these visitation rules will be directed to leave Hyades Sector DR-V C2-23." "Any individual or organization which habitually violates the rules and regulations of the site will be prohibited from entering the cemetery again, and violators may be prosecuted for trespassing. The destruction, theft, or disturbance of any physical monument is desecration of a grave site and shall be punishable by applicable laws - Sirius Inc encourages visitors to take nothing but pictures, and leave nothing but SRV tracks. Landing pads and other amenities are not available within the cemetery." 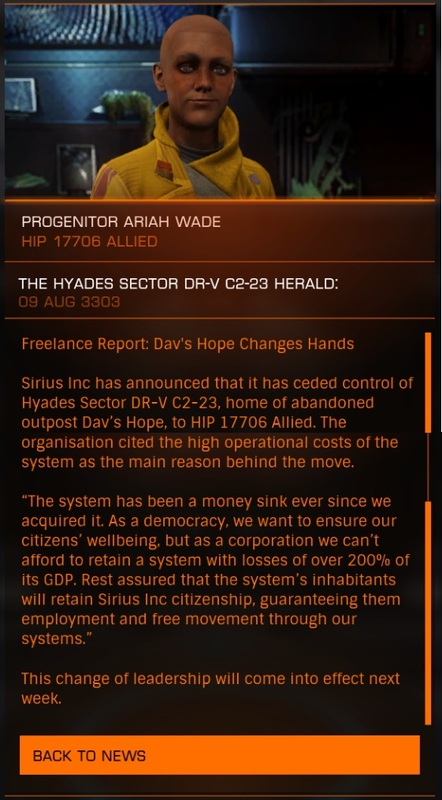 Sirius Inc has announced that it has ceded control of Hyades Sector DR-V C2-23, home of the abandoned outpost Dav's Hope, to HIP 17706 Allied. The organisation cited the high operational costs of the system as the main reason behind the move. "The system has been a money sink ever since we acquired it. As a democracy, we want to ensure our citizens' wellbeing, but as a corporation we can't afford to retain a system with losses of over 200% of its GDP. Rest assured that the system's inhabitants will retain Sirius Inc citizenship, guaranteeing them employment and free movement through our systems." This change of leadership will come into effect next week.